Monitoring the US dollar index can help spot good value investments. Rare, long term economic cycles help us see distortions and future trends such as the current over bought US dollar. 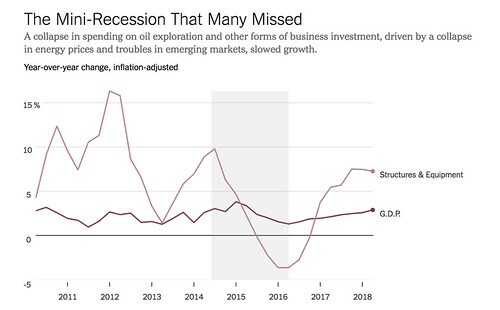 The chart below was in the September 29, 2018 New York Times article, “The Mini-Recession That Many Missed” (1). 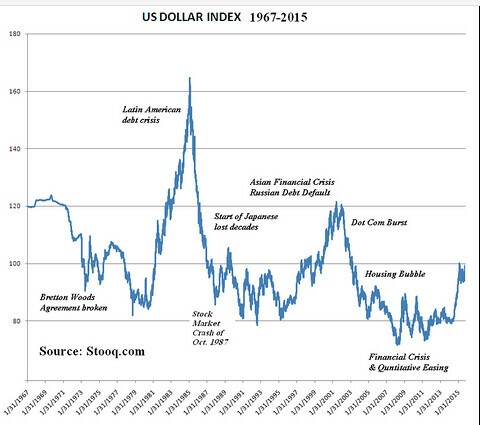 This article explained how the US dollar rose in 2015. The article explained: There was a sharp slowdown in business investment, caused by an interrelated weakening in emerging markets, a drop in the price of oil and other commodities, and a run-up in the value of the dollar. In 2015, Chinese leaders were concerned that their economy was experiencing a credit bubble, and they began imposing policies to restrain growth. These worked too well and caused a steep slowdown. That in turn caused troubles in other emerging nations for whom China was a major customer. Meanwhile, the Federal Reserve, finally growing confident that the United States economy was returning to health, made plans to end its era of ultra-easy monetary policy. As the Fed moved toward tighter money, its counterparts at the European Central Bank and the Bank of Japan were going in the opposite direction. The prospect of higher interest rates in the United States and lower rates in the eurozone and Japan fueled a steep rise in the value of the dollar on global currency markets. We can see the rise in the US dollar in this chart of a US dollar Index Futures ETF. The U.S. Dollar Index (USDX, DXY, DX) shows the US dollar relative to this basket of foreign currencies:red to other currencies. Since the greenback gained strength in 2015, the index has been hovering around 100. The 100 mark is significant due to its rarity. A look at a long term chart of the index shows it has only breached this barrier four times since 1967. This suggests that its a better than normal time to use US dollars to buy shares in non dollar markets. Long term studies suggest that the best overseas investments are in good value stock markets. Keppler Asset Management’s last market valuation shows that the Top Value Developed Markets are selling at less than half (1.50 vs 3.29) the book value of the US market. But this could be a long term investment. We have no way to know when forces will shift and non US markets will rise faster than US markets nor when the six index currencies will rise against the US dollar. What we do know is that history powerfully suggests that distortions of strength do eventually adjust and when they do, the correct normally takes place quickly. 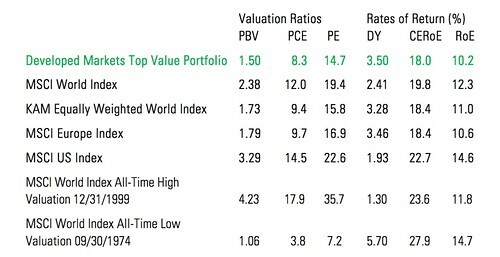 Here are the Top Value Markets and their Price to Book, PE Ratios and Average Dividend Yield. The strong dollar also offers opportunity for a reverse multicurrency sandwich. In 2015 we offered a report showing how to borrow the six index currencies to invest in dollars and dollar denominated investments such as silver. This took advantage of the US dollar’s rise. Our 2018 report shows how to take advantage of the dollar’s correction. See details below. Yet in 1986. This is exactly what I wrote in a report, The Silver Dip” that told how to borrow British pounds to buy silver. I must admit it. I was wrong. Readers who followed the report made nearly that amount ($46,299 to be exact) in only one year! I have been updating this report since. The last update showed how to get 2% loans that turned $39.95 into $28,185 profit. Now is the time to borrow low and earn high again because… an amazing investing trend is taking place. Most investors will miss it. You do not have to lose out. Really? Let’s take a look why. I have been helping readers use a little known, easy loan investing technique for over 30 years. Almost any investor can get the loans. The $39.95 is for a report that explains how to borrow $10,000… no loan application required. You’ll get the lowest interest rates in town according a Barron’s 2017 online review. Right now the loan interest rates are between 1.41% to 2.66%. Here is what happened the first time I issued this report over three decades ago. The year was 1986. The price of silver had crashed, I mean really crashed from $48 per ounce down to $4.85 in May 1986. Everyone was afraid of investing in silver. But I had been investing and writing and speaking about global investments since 1968. When I issued the Silver Dip in 1985 I had nearly 20 years of experience, so knew that when fear rules a market, the chance of profits are high. As prices decreased from early 1983 into 1986, total supply of silver had fallen to 449.7 million ounces. Mine production was restricted by the low prices at that time. Secondary recovery of silver was constricted by low prices as well. Then a “special silver pricing position” fell into place. I showed readers how to borrow 10,000 British pounds at cheap interest rates, to invest in silver. A British pound at that time was worth $1.86 so the loan was sufficient to buy 3,835 ounces of silver at $4.85 per ounce. Silver’s price skyrocketed to over $11 an ounce within a year. By 1987 the 3,835 ounces of silver was worth $42,185. The profit did not stop there! The loan was in British pounds. By May 1987 the pound had dropped from $1.86 per pound to only $1.40 per pound. The 10,000 pound loan that had been worth $18,600 in 1986 only required $14,000 to pay it off in 1987. The falling pound had created an extra $4,600 profit. All of this profit was made on the 10,000 pound loan. No extra cash was required on the investor’s part. The $28,185 was pure… extra profit. Let me add that some investors had borrowed even more. Some less. The report showed a loan to risk formula that investors could follow. That was in the 1980s. Silver’s special pricing position” does not happen often (this is why most investors miss it). Nearly 30 years passed before the “silver’s special pricing position” fell into place again. Conditions for the silver dip returned 30 years later in 2015. The availability of low cost loans and silver’s price were perfect. With investors watching global stock markets bounce up and down, most missed this important profit generating event. I had been watching the entire 30 years for “silver’s special pricing position” to return. I had been watching currency shifts and interest rates distortions so I knew the best currency to borrow. From 2011 to 2015 the price of silver had once again crashed from $48.35 to below $14 an ounce. The “special silver pricing position” reappeared. I dusted off the “Silver Dip” and updated it to the “Silver Dip 2015”. I prepared a “Silver Dip 2015” report and shared it immediately. The report paid off again. 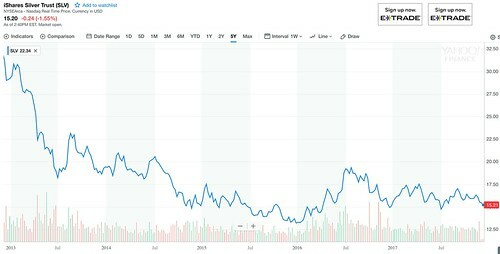 From July 2015 to July 2016, the price of the silver ETF iShares Silver Trust (Symbol SLV) rose from $13.92 and ounce to $18.71. 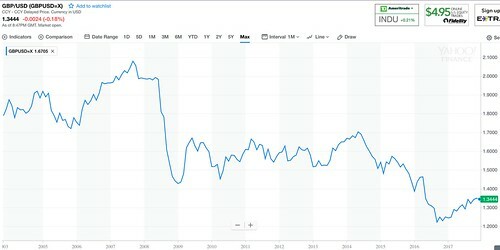 You can see the rise in the finance.yahoo.com chart below. A 10,000 pound loan (the pound was $1.52 per pound) purchased 1091 shares of the silver ETF SLV. Those Shares rose to be worth $20,421 by 2016, a 34.34% additional profit. The loan again was in British pounds. From 2015 the pound dropped from $1.52 dollars per pound to only $1.39 dollars. The 10,000 pound loan that had worth $15,200 in 2015 only required $13,900 to pay it off in 2016. The falling pound had created an extra $1,300 profit. All of this profit was made on the 10,000 pound loan. No extra cash was required. Again this was pure… extra profit. Some investors borrowed less… others borrowed much more so their profits were even higher. All the extra earnings were derived from a low cost, easy to obtain loan that almost any investor can have. I would like to help you learn how to tap into this type of profit that most investors will miss… in my newest report “The Silver Dip 2019”. First let me answer a really important question… that if you have not asked, you should. Yes. There is always risk when you invest. The first golden rule of investing outlined in the Silver Dip 2018 report is…”there is always something we do not know”. The numbers above are what have happened. We never know for sure what will happen. 2015 was similar to 1986. Investors were afraid of silver. Courage was required and this is exactly why dip investments work so well. When most investors are afraid of a precious metal, extra good value is created! Plus there is a way to dramatically increase the odds that your investment will be safe and that you’ll reap the type of high rewards I have described above. The formula for increasing safety and improving the odds for profit are included in the new report, “Silver Dip 2019”. The benefit of 50 years experience. With so many years of experience in watching markets, metals, bonds, interest rates and currencies, I have learned many special pricing situations to watch for. These special opportunities do not appear every day. That’s why they are special. Unless you have seen them come and go, it’s hard to see them coming again. That is why I was willing to wait for years for silver to be in a special pricing position. Our courses and reports are about finding good value and they have been helping astute readers find value investments, again and again for 50 years. The “Silver Dip 2019” report shows a new, even bigger opportunity. I continuously watch for aberrations in currency and precious metal markets. Sometimes a rare quirk, such as we saw with the pound loans and the Silver Dip offer potential for profit, with very little risk of long term loss. Investors who speculate on platinum at the correct time can make fortunes. Success is almost guaranteed. In fact an 89 year study showed a 99% change of success when sequence distortions are worked in a certain way. We are stalking precious metal opportunity now. This opportunity is explained in the report “Silver Dip 2019”. Here is why there is no risk for you. The report is 100% guaranteed. I do not sell book, reports and courses. I offer benefits. If the Silver Dip 2019 does not bring you the benefits you expect, just let me know within 60 days and I’ll send you a quick, no questions asked, full refund. I can’t promise that silver’s price will rise in the next 60 days. I can guarantee you’ll be fully satisfied with the report or… you can have your money back in full.